Cast of a micro-drill from the Cahokia Mounds site. This micro-drill was discovered on the Cahokia Mounds site within an area of about 3.7 acres on the Kunnemann tract where many thousands have been found. These small drills were once hafted onto reed shafts and used to drill holes in shell and other soft organic materials. Most of these types of drills were probably used to make beads. The Cahokia people were manufacturing very large numbers of shell beads. At least 60,000 drilled shell beads were found in Mound 72 at Cahokia. These were divided into seven different main types or styles and within those there were other subtypes based on size and form. Bead making experiments have shown that it takes about ten minutes to drill one bead. At this rate it would have taken 1,250 eight hour days of steady work to complete the drilling part of the process to produce the 60,000 beads that were found in Mound 72. 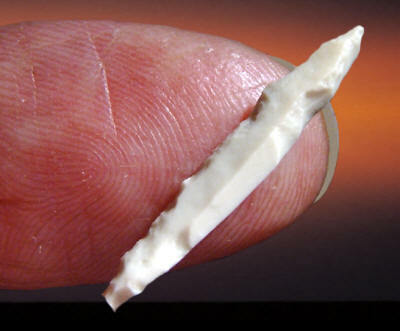 This micro-drill is made of white Burlington chert and it measures 1 1/16 inches (2.6 cm) long.